Stasis Dermatitis: What is it? 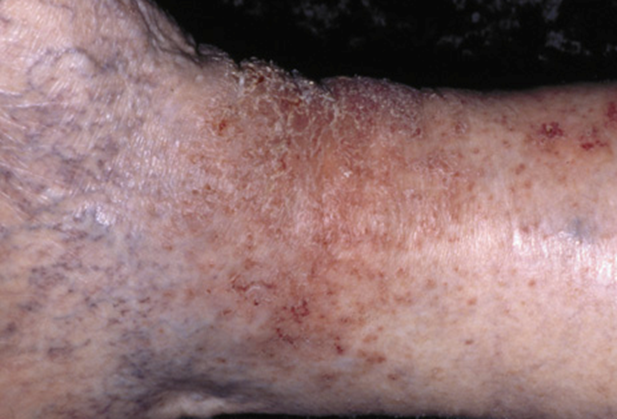 Stasis Dermatitis is a chronic rash stemming from poor circulation (low oxygen) of the legs due to internal varicose veins or poor circulation for other reasons. This includes poor heart function and any type of blockage to the circulation. Normally, your heart pumps fresh oxygenated blood to your legs and feet. The blood is supposed to go down, and is then supposed to return for reoxygenation. 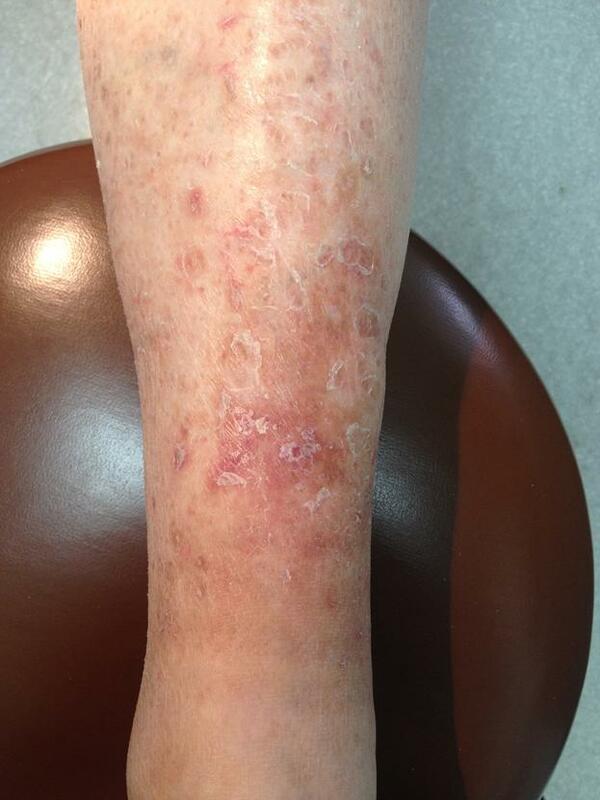 Stasis dermatitis usually occurs in swollen legs with poor circulation. In stasis dermatitis, the blood is unable to return to the heart for fresh oxygen. The result: Blood tends to pool at the feet, ankles, and lower legs. Because of this, there is low oxygen to the tissues, and thus, stasis dermatitis develops. This condition is worse in diabetics. Also, if the affected areas are injured, or if a person applies continuous pressure to the area, the skin suffocates and an ulceration or "pressure sore" may develop. 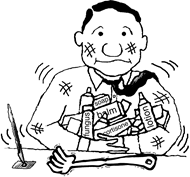 Pressure sores require therapy above and beyond that of stasis dermatitis. Think about it: Anything that helps circulation will also help stasis dermatitis. Anything that prevents circulation will also make stasis dermatitis worse. Think about your legs and what you do with them. Are you helping circulation or are you hindering circulation? Sensitive skin on the legs can become itchy when exposed to allergic type substances such as perfumes, dyes, conditioners, powders, anti-perspirants, hair sprays, grasses, plants, fragranced products, shampoos, unrinsed laundry detergents, fabric softener sheets, bleach, please double rinse your laundry! Avoid dog or cat hairs, carpets, chemicals, Aloe Vera, PABA, detergents, acrylic nails, polishes, nickel, elastic, latex, and other allergic substances. Soap Is Your Big Enemy! Another factor is the use of soap. Excessive soap will actually make stasis dermatitis worse. Soap is bad for stasis dermatitis. Dial, Zest, Lever, Safegaurd, Ivory, gels, and Irish Spring are among the worst. Soap removes your good skin lipid oils, which are cholesterol, ceramide, and free fatty acids, needed to hold in moisture. If your oils are removed, the skin develops cracks, fissures, and dry inflammation. Soap should not be used on dry or sensitive skin. Most of us use far too much soap. Actually, plain water is often just enough to cleanse the skin. If you can't live without soap, it's OK to use a gentle cleanser for your face, feet, armpits, and groin, but not on your legs! Use Gentle Face and Body Cleanser to cleanse your legs. This special gentle cleanser cleans without stripping your good skin oils: Cholesterol, ceramide, and free fatty acids. 2. After bathing, thoroughly lubricate your skin using one of the methods described in this educational sheet. Ask the receptionist for the little ABC Dry Skin Booklet. 3. After your bath, you should not towel dry. Wipe off the water with your hands, then, apply a thin film of True Moisture® Replenishing Cream to your legs and entire body. This film will seal in your new moisture. You are now well emolliated. 4. For shampoo, use fragrance free True Moisture® Gentle Shampoo. Exercise: Keep your leg muscles working to increase circulation. Your calf muscles are very important as they help pump blood back to your heart. When you use your calf muscles, you are actually helping to bring fresh oxygen back to your leg tissues. The more oxygen the better! Elevation: When not walking, you should keep your legs elevated. You may want to purchase a small plastic stool to take with you. Don't ever let your legs dangle as in an airplane or long car trip. Do not stand in one position for very long. Common sense will show you that circulation will improve the more you keep your legs elevated and the more you move your leg muscles. If possible, try a regular walking program. 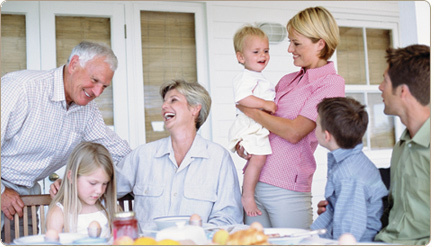 Elastic Hose: Dr. Jacobs can prescribe special elastic hose called Jobst Stockings available at your pharmacy. 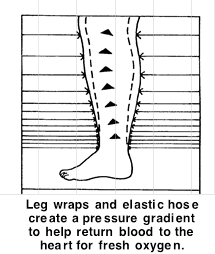 The elastic hose prevents blood from pooling and helps return blood to the heart for fresh oxygen. Doctor, please give me other helpful hints. In addition to the three E's, Dr. Jacobs may also have you apply special medicated ointments, or apply special leg wraps (Ace wraps vs. Cellophane occlusion vs. Unna Boot) to bring your skin back to health. An Ace Wrap is an elastic bandage available from your pharmacy. Cellophane can be purchased at the grocery store. An Unna boot is a zinc impregnated wrap available from your pharmacy. The wraps can be changed. Ask your pharmacist about them. Finally, be patient. You need to be consistent and closely follow the four E’s. 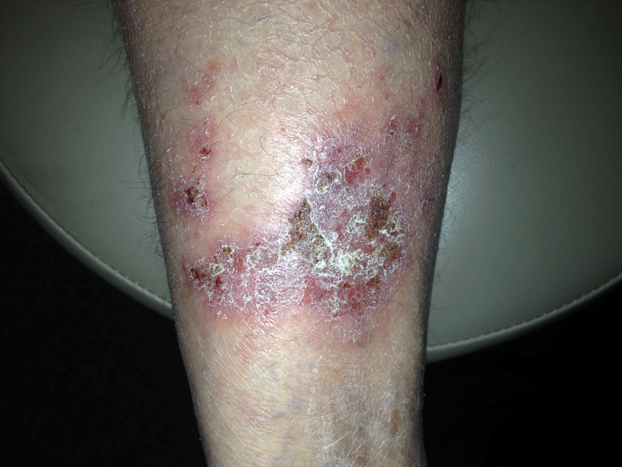 Stasis dermatitis can take months to improve. If you do not see improvement after two months, please check yourself to see if you are following the doctor's advice. 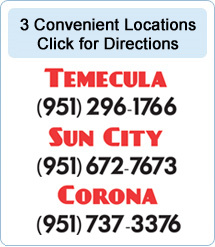 If you are following the advice given in this information sheet and are not better, Dr. Jacobs may recheck your condition or refer you to a vascular surgeon to evaluate your circulation.